The Electro Harmonix Micro Clone Theory Guitar Effects Pedal is a faithful recreation of the original 1970's Clone Theory, is a delightfully compact, pedalboard-friendly unit. Highly regarded for its stark chorus creating abilities, the Clone Theory offers both mono and stereo output options, taking your tone from an abrupt and striking vibrato, to a lush and velvety chorus soundscape. The Micro Clone Theory is equipped with three modes to choose from: Chorus 1; Chorus 2, and Vibrato. Chorus 1 has a preset DEPTH setting selected by Electro Harmonix themselves to what they consider to be the perfect chorus. However, you can adjust the rate of modulation using the RATE control. Simply activate the footswitch when you want to initiate beautiful chorus and you're away. Chorus 2 allows you to adjust both the RATE and DEPTH of modulation to give you complete control over your chorus effect. In Vibrato mode you again have full control over RATE and DEPTH, but you can expect a significantly higher manipulation of the tone's pitch, adding a textured character to your output. As with other Electro Harmonix pedals, the Micro Clone Theory is True Bypass-enabled. Therefore, when the pedal is inactive, the input signal is directly connected to both the Main and Stereo output jacks, leaving your guitar's tone unblemished and pure. The main output jack can be used for mono operation. But when used in conjunction with the stereo output jack, your routing options are greatly expanded. The stereo output is 180-degrees out of phase from the main output, which means the extremes of modulation are heard at opposite moments at each output, for noticeable panning between the signal outputs. The panning rate can be adjusted by using the RATE and DEPTH knobs. Whether used by itself, or paired with overdrive, distortion, delay or pitchshifter pedals – whatever you set your mind to really! 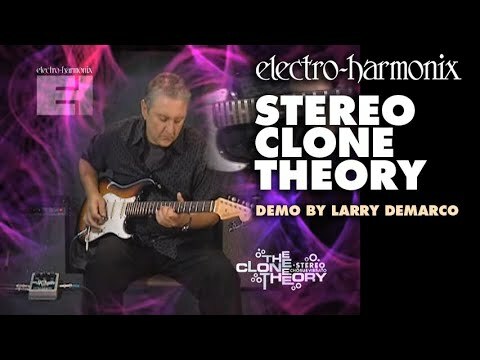 – the Electro Harmonix Micro Clone Theory Guitar Effects Pedal is a must have unit in any guitarists tonal arsenal.